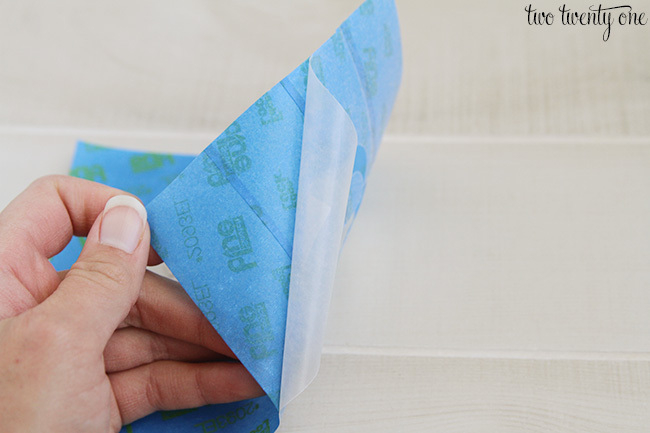 Thank you, ScotchBlue & The Home Depot, for sponsoring today’s post! With spring comes spring cleaning and organization. So I decided to whip up some organized cleaning and gardening caddies to help me stay organized and to make household tasks a little more streamlined. To give them a little more flare (and for it to be obvious to Brad when I ask him to grab the bathroom caddy), I created stencils and labeled each caddy. I started by grabbing the wax paper and painter’s tape. 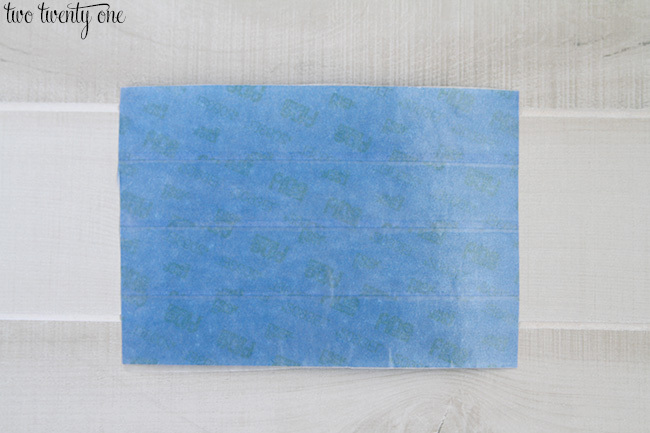 I adhered the tape to the wax paper, slightly overlapping the tape. This is how the backside looked. 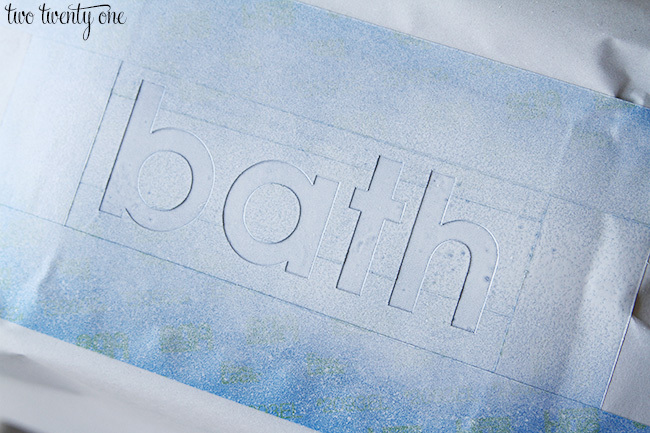 Then, I cut the stencil out using my electronic cutting machine. 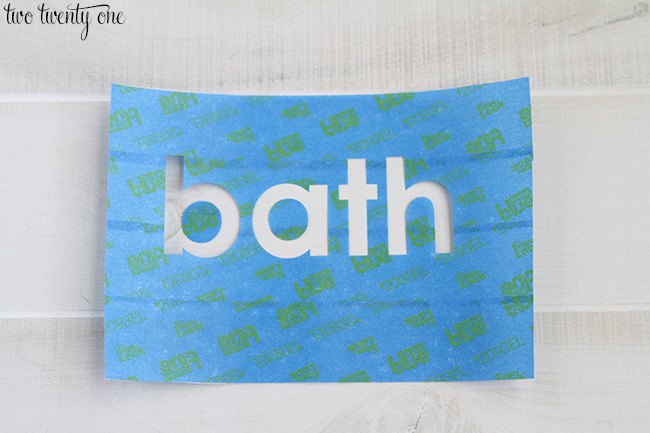 If you don’t have one, you can either stencil the letters onto the tape/wax paper and cut them out or print the word, cut it out, trace it onto the tape/wax paper, and cut it out. 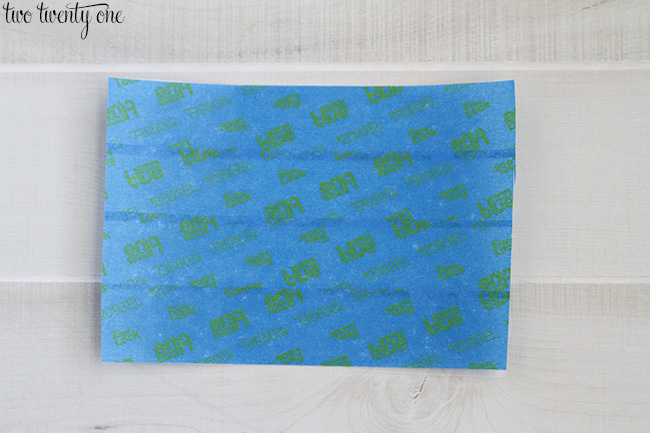 Then I carefully peeled the wax paper off of the painter’s tape. This is what it looked like when I was done peeling. Next, I adhered the painter’s tape stencil to the caddy. Then it was time for some spray paint. I’m a Rustoleum girl all the way, so I used their Ultra Cover 2X coverage spray paint in satin blossom white. See, it even binds to plastic. Here’s how it looked after one coat. I ended up doing two coats, and removing the stencil before the second coat dried. This is important. 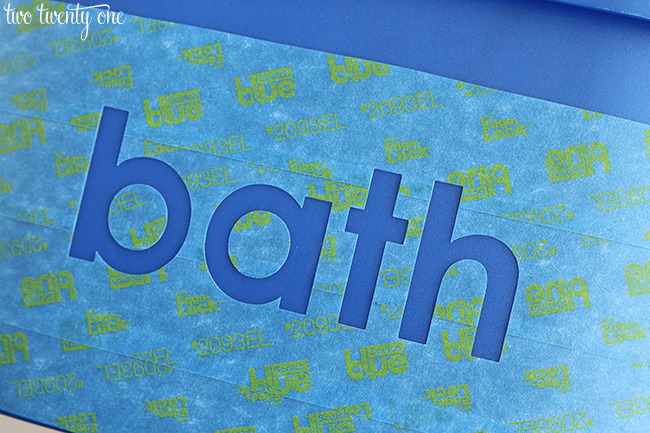 If you wait too long, and let the paint dry, you can risk pulling the paint off with the stencil. I filled the bathroom caddy with all my bathroom cleaning supplies– Windex, paper towels, magic erasers, toilet bowl cleaner, disinfecting spray, disinfecting wipes, gloves, and a cleaning brush. Using the caddy is so much easier than lugging all those supplies into our bathrooms by the armful. I decided to make another caddy– an organized gardening caddy. Now I can just grab the caddy and work in the flower beds. The gardening caddy has everything I need– kneeling pad, hedge trimmers, garden shears, scissors, trowel, transplanter, cultivator, and gloves. This will make going from plant to plant so much easier. I also made a car washing caddy. We used to store everything in a bucket, but we would always have to take all of the stuff out of the bucket to put the water and soap in to wash the cars, and then we’d have to wait for the bucket to dry to put everything back in. Annoying. 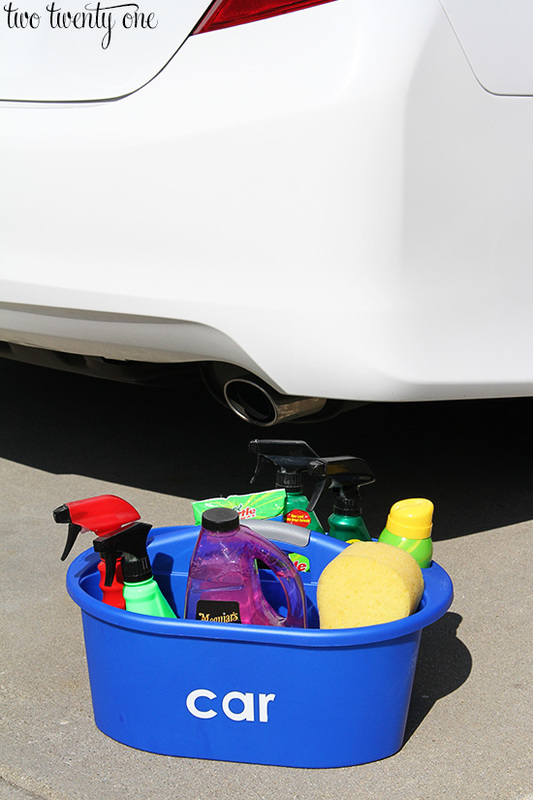 Now, we can just grab the caddy and a bucket and we’re ready to clean our cars– inside and out. To help with your spring cleaning, organizing, and gardening, I’m giving away a $50 The Home Depot eGiftCard! You must use the Rafflecopter widget below to enter. Check out The Home Depot and ScotchBlue for more products to help with your spring cleaning. I actually have one of those caddies and I need a few more! They’re so handy! I would join, but I don’t have a personal FB page, just my shop. BTW, if you’re interested, I’m having a HomemadeSoapnSuch Giveaway, open until Friday night, three winners, no hoops to jump through. Check CranberryMorning, any post, all this week. LOVE your stenciling job on those caddies. I need to do that! I’m moving in 16 days… $50 to The Home Depot would be a LIFESAVER! Love the idea of caddies for different areas! I may try it! Thanks! I would use the $50 gift card to spruce up my front yard area. Perhaps some flowers in hanging pots to use on my double shepherd’s hook. I’m out of a job, so this would be a fun way to spend some dollars! My husband would want me to save this for when we move from apartment to house in 5 months, but I’d want to spend on plants RIGHT NOW! I would use $50 for some paint – it’s that time!! I would love to paint my house, so I would use the $50 to buy painting supplies! We have to redo our garage roof, so I’d put it toward that! I would use the gift card to update my patio. I would us it for spring cleaning! I would buy shelves! My boyfriend and I are moving in together in August, and our apartment is tiiiiiiny. We need all the storage we can get! I’d use the gift card to make a photo prop floor and wall combo. I would use it towards supplies for a diy headboard that I’ve been dreaming up the last few months! I’m remodeling my bathroom so a $50 Home Depot card would be put to good use! I would use to toward a grill. I could definitely use more plants and flowers in my life! I like the gardening caddy. My husband and I anyways make 50 tedious to the garage for different tools when we work in the yard, and invariably we leave some tool in the yard and it rains. The caddy would make it easier to get everything back in the garage. I would love to get some craft paint to finish up some projects! I seriously need to make some of those caddies! I would use the gift card for paint. I have about 1,000 things/rooms that I want to paint right now. I’d get stuff to spruce up our front porch! I love these! They look great! So cute! I love good organization and would use the gift card to get my garage in order! Such a great idea!! I NEED to do this! Supplies to make a garden! New light fixture for our front door. Our current one is beyond scary. I want to build a porch with my husband for summer. This would help with the supplies. I need to create some flower beds around my property. Would be a great start. We would use the gift card toward our long and growing list of home improvement projects! 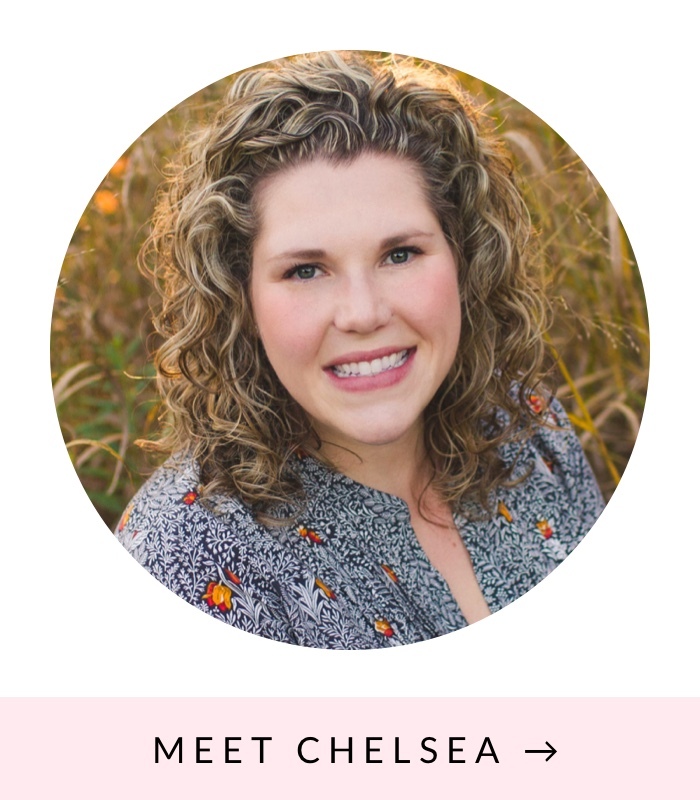 Sprucing up the yard, retiling the fireplace, building side tables…and much more! I’d use the gift card towards a new umbrella for our patio set! Being new homeowners means we have no shortage of things that we could use a gift certificate for. 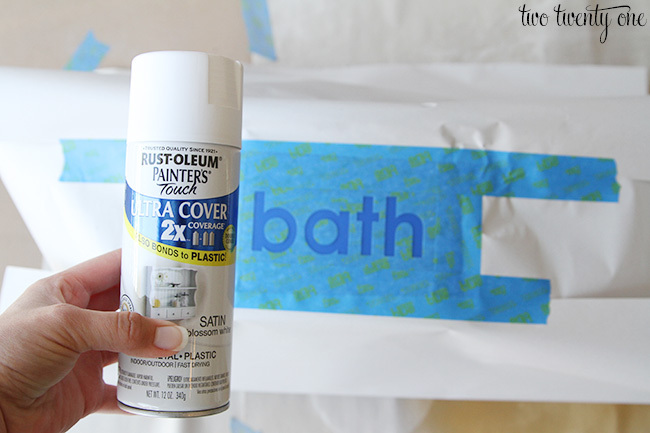 We are currently remodeling our basement bathroom, and Home Depot is our go-to spot weekely! We could use this to help purchase the fixtures! I would buy some plants for our front entry and our desk, they need a refresh after the long winter!! Love this! I would use the Home Depot give card for some new plants. My yard definitely needs it! I would buy garage organizing items and new gardening hand tools. I’m ready to get my hands dirty. I would buy flowers and TRY not to kill them! I iust rented a bldg. To open my own nail salon. Just about ready to do some serious cleaning and painting. This gift card would be a blessing! I’m torn between painting my room or plants for my landscaping! I would use the money for our new house. Its so nice going outside as a family and gardening or playing together!!! I would use a Home Depot gift card to rebuild my master bathroom that we gutted – 2 years ago! So many projects on the list! I would use it for some shelving for the garage. Definitely want to get some painting done this spring! I am planning raised beds to grow veggies! 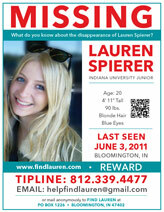 $50 would help! We need to paint/stain our deck so the gift card would definitely help that cost! we would use the gift card to repaint our terrace and buy flowers/ plants for out there! Trying to spruce it up and make it pretty after the long awful winter we had up here in NYC! Our flowerbeds need a serious makeover. $50 would be disappear in minutes in the HD garden dept! We are starting to do some work to our back yard, so I would put the gift card toward some new flowers or pavers to line the flower bed! We need a new lawn mower. Paint! Nearly every room in our house needs to be painted! 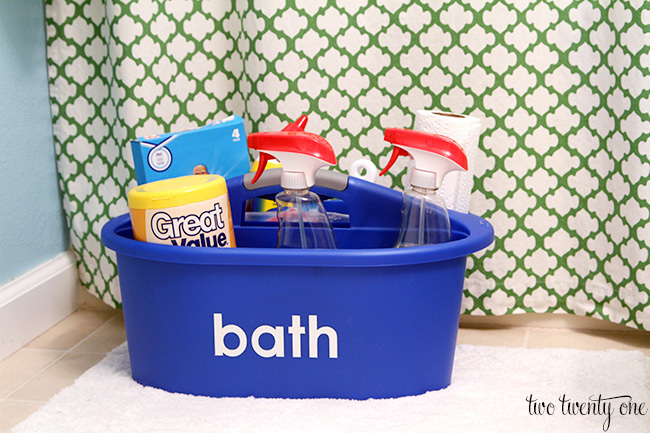 What a cute idea to organize the not so cute or fun cleaning supplies! I would use the $50 gift card to buy paint – lots of paint. I would buy paint. We are remodeling our basement so this would be great! I’d buy flowers for my garden. I’d get some much-needed paint! The weather is getting so much warmer and I’d love to re-do my bedroom set. I know exactly which color I’d choose too. Buy stuff for our new house! I would use it for vegetable plants. I would use it to get our front porch ready for summer. Paint! I have some fake paneling that desperately needs to be covered. I neeeed paint! My yellow apartment is slowly killing me! I would use the gift card for my hubby’s father’s day gift. He needs a new lawn chair & table. We are house hunting right now, so we would put it towards something for a new house….like locks, paint, etc. I would love to get our outdoors spruced up! We have nothing out there now and it’s a little sad. A Home Depot gift card would help me take care of a long overdue project. I’d buy some paint + supplies to spruce up an old, but well loved bookshelf. I bought it at a garage sale in 1985 – (almost 30 years ago!) for just five dollars! Someone built it by hand and did a great job because it’s (still) very sturdy. It’s big too, at almost 5′ tall and over 3′ wide. But it is UGLY! Prior to me owning the bookshelf It was painted at least 3 times, 3 different colors (yellow, light brown and gray). I plan to remove all the old paint, fill in scratches and nicks, sand it, and then paint it Navy blue. I’m so excited to finally give this old piece some TLC. Thanks for the giveaway! I’d put it towards replacing some broken things! New shrubs in front of our bay window. Doesn’t look like the Holly bushes survived the rough winter we had! I would definitely use it in the garden center! 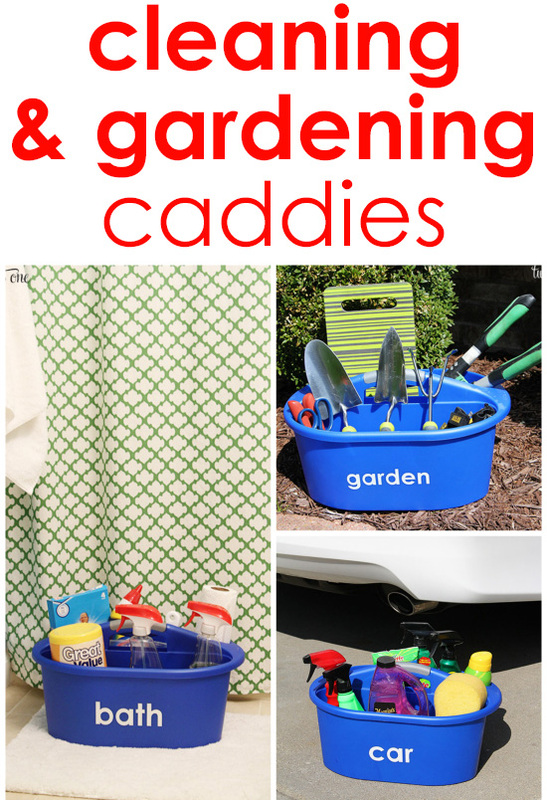 I especially like the gardening caddy! I’d definitely be spending that Home Depot money on some gardening supplies. I could spend every other day there, ogling the plants and such. Love this project! Although I do vinyl for my biz, I love that you chose to paint this! I have several of these bins with a variety of items (cleaning, car, pets, even a separate one for the bathroom cleaning supplies). This is a great use for marking each one without having to look at the contents! Thank you for sharing! 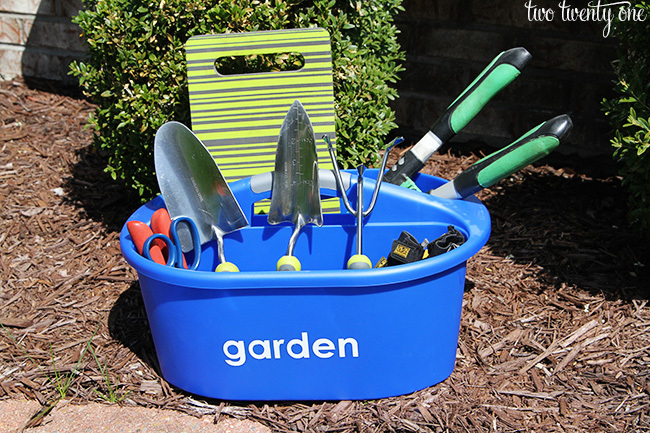 I love this idea of using the caddy for gardening supplies. My husband actually has a few of these in the basement (hence the reason our basement is so cluttered!) and I was trying to make use of them. I’ll definitely be using one for gardening tools. I tried using one for our cleaning supplies, but it didn’t fit under our sink so I stopped using it! Great organization ideas. Thanks for sharing on Idea Box link party. I’m featuring this on my blog tomorrow.